June Otani, New School Bulletin Vol. 23 No. 3, Sept 1965. The 1918 proposal to create a “new school” ended with a rousing declaration of the innovation of the idea, the significance of the moment, and, most of all, the importance of New York. The proposers believed that this city — “the greatest social science laboratory in the world” — would attract scholars and leaders to this educational experiment. It was chauvinistic — and prescient. 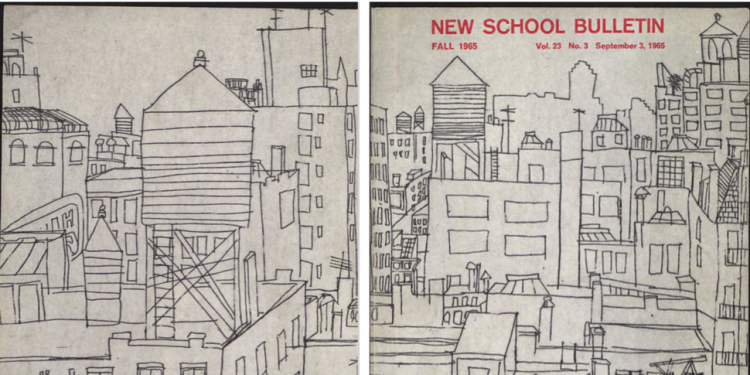 New York has been integral to the meaning, shape, and impact of the New School. It is one of the only factors in the often-opportunistic agglomeration of the current university that has reached across its many components and remained constant. Classical musicians learn to develop neighborhood concerts; designers remake parking spaces on 13th Street for outdoor sitting; and media studies researchers uncover the sounds of the city. Studying New York City has been one way that the school has defined and realized its purpose of meeting the needs of the present moment. The first full semester of courses in Fall 1919 set up this proposition. One of the school’s founders, Charles Beard, directed the Bureau of Municipal Research and oversaw a series of lectures by members of the Bureau aimed to educate students on public administration. Attention to governance, reform, and action continued with a course on city and regional planning in Summer 1923 by the influential British urban planner Patrick Geddes. Just a few months later, though, in the Fall of 1923 a city-focused course signified a turn in the school’s emphasis, from politics and policy to the humanities. Lewis Mumford’s class “Architecture in American Civilization” considered architecture as an aesthetic and material lens to view the history of the country and, even closer, of New York City itself. Mumford taught courses as he was taking them, educating himself and creating a new field of intellectual inquiry. (Decades later, so too did Gerda Lerner in the field of women’s history.) Despite never completing a formal degree — The New School disdained to offer degrees at this point — Mumford became one of the first urbanists, people who looked broadly at how cities operate, not confined to specific fields such as planning and architecture. He first studied buildings — Sticks and Stones (1924) on American architecture came out just after his first course at The New School — and then moved on to offer a more unbounded view in influential books such as The Culture of Cities (1938). Mumford’s attention to architecture and urban life informed his decisive recommendation of Joseph Urban to design the New School’s first newly constructed building at 66 West 12th St. This building, inaugurated in 1931, was intended to showcase the idea of the school — embedded in a residential block but forcefully different from what surrounded it; doors opening literally and metaphorically directly onto the street; light and color (90 different paint colors in the original interior!) beaming into the dark evening. It was a first example of “international style” in an American city. The building also proclaimed the importance of the arts to the school as urban visions became crystallized in modernism. Berenice Abbott taught photography at The New School as she turned her lens on the city around her in Changing New York (1939); Aaron Copland taught music as he composed Quiet City (1939). The New School was the place where these modernists trained others to see their visions of New York, setting up the vital role of the arts in the school that continues to this day. Others at The New School turned their attention to problems plaguing the city’s residents. Charles Abrams began teaching soon after he helped write the legislation that created the first municipal housing authority in 1934; the model for the first federal housing legislation passed the same year. From 1936 to 1967 Abrams taught courses on housing, real estate, and land policy, many of which served as the basis for books. In Revolution in Land (1939), he thanked the influential administrator Clara Mayer for her suggestion to teach a course on the “Modern Problems in Real Estate” — the kernel of the idea for the book. In Fall 1940, Abrams initiated multiple courses and programs on public housing and Lewis Mumford returned to teach the evolution of “The Modern City” with Albert Mayer — Clara’s brother, a real estate developer, and a board member of the school. A series of public programs focused on Greenwich Village. And sociologists Alfred Schütz and Julie Meyer at the Graduate Faculty analyzed the category of strangers, bringing their experiences as exiles to bear on their new status as New Yorkers. Abrams attempted to corral all these courses into a field, first with a short-lived Institute for Urban Studies and then another short-lived Center for Urban and Regional Studies. This interdisciplinary inquiry that became urban studies at The New School had wide, if diffuse, effect. As with most courses in the Adult Division, students could include engineers, real estate agents, reporters, and social workers: a mix that confirmed and extended the approach the school was developing, that studying cities required multiple perspectives. Lloyd Rodwin, a student who randomly sat in on one of Abram’s courses, thought he wanted to be a high school teacher. Instead, he followed Abrams’ path in focusing on housing and international development and went on to found the MIT-Harvard Joint Center for Urban Relations in 1959. By this point, The New School and New York were closely intertwined. A March 1958 panel, “A Look into the Future,” was as much about the school as its neighborhood. The panel included Abrams, by that time chair of the New York State Commission Against Discrimination, the architect and city planner Victor Gruen, the civic-minded financier Robert Dowling, and an editor of Architectural Forum named Jane Jacobs. 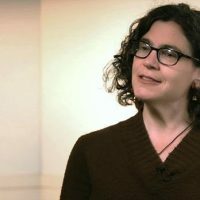 Jacobs’ talk that evening discussed the necessity of maintaining a diverse mix of uses in the city’s economy and on the city’s streets, creating the web of relationships that she saw as crucial to urban vitality. These ideas were a precursor to her book Death and Life of Great American Cities. When she received a grant from the Rockefeller Foundation to support her writing, she chose The New School to administer it. The school was near her home in the West Village but she also thought it was the only place where the study of cities was taking place with the necessary complexity, multiplicity of perspectives, and acute sense of urgency. The New School can rightfully claim a role in Jacobs’ paradigm-shifting ideas about urban issues worldwide. It realized this purpose first, though, in its home with the creation of the Center for New York City Affairs (CNYC) in December 1964. Unlike previous initiatives on city matters, this one lasted — and continues to this day. CNYC brought together the multiple perspectives on understanding urban issues that had accumulated over the years at the school and applied them to New York through courses, symposia, and an “information service.” (The City Almanac was one short-lived channel of information.) Just five years later, the center attracted two thousand students a year and began working on a graduate degree to train generalists with a knowledge of urban issues rather than specialists, a fitting consummation of the school’s long, winding, and embracing perspective on urbanism. At the 50th anniversary of the New School in 1969, President John Everett proclaimed the success of CYNC as a foundation for the future of the school. Harking back to the school’s original mission to meet current needs, Everett declared that what was most apparent now was “the application of knowledge and scholarship to problems of the city.” Two new buildings — the centerpiece of the half-century development campaign — would make this focus concrete: one for CNYC and a new Creative and Performing Arts Center, a realization of another long-standing strength of the school. Neither happened. What did happen just a few months after this declaration was a surprise merger with Parsons School of Design. In many ways the coming together of Parsons and The New School created another way to meet the present moment through studying New York. Parsons had undergone significant curricular change in the 1960s, moving its narrower focus on interior design to environmental design. Instead of decorative period rooms, studio projects offered new designs for the House of Detention for Women in Greenwich Village, just two blocks away from The New School, and a Mobilization for Youth center on the Lower East Side. Two years after the merger, Parsons faculty member Jean McClintock Gardner pushed the curricular ties even further in her 1972 Union Square project. Examining vehicular and pedestrian traffic, Gardner and her students developed ideas to enhance accessibility and use. Design moved from elegant drawing rooms to the public square. As The New School acquired more programs — from media studies to jazz and drama — New York became the place where those parts found common ground for related questions, sites of research, and application of knowledge. The university always looked far beyond the city as well, to Europe for its model of social sciences and now to India and China for defining issues of sustainability, climate change, and the transnational flow of goods and ideas. But New York is the place in which the New School found its métier. In this place, the school figures out how to meet the current moment and imagine the next one.